This is an 8-page chronology of UFO incidents for 1963. From August 4th into mid-month, there was a flurry of UFO sightings, mostly in southern Illinois. An advertising plane in the Chicago area caused some erroneous reports about the same time. Once the reports had been publicized, the planet Jupiter also was reported as a UFO on a few occasions. Our Vincennes, Indiana, NICAP Subcommittee investigated several of the key cases, submitting taped interviews and investigation reports. Our thanks for these chronologies must go to our documentation team: William Wise (Project Blue Book Archive), Dan Wilson (archive researcher), and Brad Sparks (Comprehensive Catalog of Project Blue Book Unknowns). Last, but not least, our thanks to Jean Waskiewicz who created the online NICAP DBase (NSID) that helped make it possible to link from the cases to the reports themselves. The National Academy of Sciences, Space Science Board, released a report (Pub. No. 1079) urging that a search for extraterrestrial life "be proclaimed the top-priority scientific goal of our space program." Feb. 5, 1963; Nr. Washington, D. C.
11:45 p.m. Planes scrambled, UFOs over missile site. Object had intermittent yellow-white glow, and at its closest point appeared to be about three feet in diameter. 3:15 a.m. It involved the contingent of the Royal Navy's North Atlantic Fleet which had been participating in excercises off Norway for about three days. Briefly, the incident occurred at 3:15 AM somewhere in the Artic Ocean, between Spitzbergen Island and Norway (30-50 miles off the Norway coast). The object was tracked on the ship's radar at 35,000' and then by sonar after it entered the water and was tracked at 50' below the surface and continued into deep water at a range of 20,000 yards. The radar signature indicated it was 100' to 120' in diameteer. Object was also tracked by other ships and the order was issued for the fleet to execute an evasive "Z" pattern maneuver. Jets were scrambled. The duration was at least 15-20 minutes and the incident included maneuvering. No visuals were made. (MUFON Journal, 1984). Members of the Santiago NICAP Subcommittee observed a pulsating luminous white sphere about 7:50 p.m. The UFO moved from north to south, disappearing in the distance after about a minute. May 23, 1963; Sunnyvale, Calif.
2:03 p.m. local time. Three radar tracks were detected at a speed of 1400 mph by an airborne radar. There was no visual sighting although the targets were indicated at ranges of 2, 3 1/2 and 5 miles. Two of the targets were following identical paths. The length of the observation was 3 minutes. June 16, 1963; Palmerston, North City, N.Z. June 18, 1963; Niagara Falls, N. Y.
June 19, 1963; Burlington, Mass. June 21, 1963; Chicago, Ill.
June 26, 1963; Rockland, Mass. June 26, 1963; Pine Crest, Calif.
Large blimp like object reported. [In this area is the Davis Monthan AFB Titan II Missile Site, home of the 390th Strategic Missile Wing consisting of 18 Launch Facilities around the Tuscon area]. 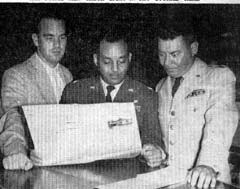 July 20, 1963; Springfield, Ill.
Orville Hartle, Chairman of the LaPorte, Indiana NICAP Subcommittee, on a brief visit to Florida, observed a UFO. He obtained a full report with signatures of 13 additional witnesses. The object appeared in the northwest sky first as a red, then a white moving light. To the west, the star-like light hovered, then moved south. To the south, the object began a series of gyrations and pulsated on and off, visible intermittently. It moved up and down, back and forth, once emitting a flare of greenish-white light. 10:10 pm. Former Mayor Harry Bishop observed a large, bright red light which appeared to be only about 300 or 400 feet high, was oval shaped, and was "about the size of a washtub." It followed a car along Centralia road. When the car stopped, the driver jumped out and looked upward. The UFO stopped and hovered, then moved away at right angles to its original course at a high rate of speed. It seemed to be making a light whirring sound. Bishop estimated that the fireball was in sight for from ten to 15 minutes. While vacationing in Hawaii, a chemist observed a UFO and reported it to NICAP. Dr. Richard Turse, Princeton, N.J., about 11:30 p.m., saw a round reddish object pass overhead from southwest to northeast. The UFO "traveled across the sky at great speed making two sharp turns at the same speed." A silvery disc-shaped UFO was seen by two young boys, whose parents agreed they must have seen something unusual. The disc passed from north to south, emitting a hum intermittently. TV difficulty, viewer called outside to see UFO. Object hovered, darted at high speed. TV I/F noted in area of three towns. Sept. 26, 1963; Sunnyvale, Calif.
Oct. 4, 1963; East Hartland, Conn.
Disc, E-M, occupants, numerous traces. Nov. 3, 1963; Corona, N.Y.
Nov. 7, 1963; San Francisco, Calif.
Fireball observed, shock wave felt, over Bay area. Unidentified signal picked up by local radio station. An official Argentine Navy UFO report. Combined visual and E-M incident involved the Navy transport A.R.A. "Punta Medanos." A large airship (never identified) was sighted from the stern of the vessel. The huge UFO was round-shaped, and it was moving at great speed. It displayed no lights and made no sound. As the unknown object appeared, the needles of the ship's magnetic compasses "suddenly and simultaneously" swung off course, pointing toward the UFO. At the time, the Navy report states, the UFO was 2,000 meters (well over a mile) away from the ship. Deputy Sheriffs chased a low-flying UFO which first appeared as a white flashing light. At times the object seemed to have a "big divided window" on it. When the UFO hovered, the deputies approached and flashed their squad car light. Then a flashing red light became visible on the UFO. The object finally moved away to the northwest making a motor-like sound. Other residents reported a flashing light and "high-pitched" or "whining" noises at the same time. Nov. 20, 1963; Neche, N.D.
Two high school girls reported that a bright orange, oval-shaped object circled their car at night while they were en route home. They were on highway 55 east of town when they first saw the UFO. It appeared to be surrounded by a light haze. The glowing object sped across in front of the car and circled around the side before disappearing to the southeast. A motorist stopped at a traffic light about 9:30 a.m., noticed a strange object "glittering in the sun." Then the object tipped on edge (revealing a disc shape) and quickly sped away to the southeast. The shape was "like a pancake." An oval UFO, metallic-looking like aluminum, was observed hovering in the clear morning sky by hundreds at a resort. One description said the object "balanced gently in the air."